The Internet of Things (IoT) is changing much of the world we live in today. The idea of using an affordable device to capture information and connect that to the internet can create new possibilities with powerful insights never before possible. Using machine learning and artificial intelligence, we’re bringing this data to life for businesses wanting to go beyond just location. Imagine a giant network of small devices collecting information always and continuously talking to each other. With affordable IoT (Internet of Things) devices, gathering this data is easy, but making sense of it is the hardest part and it’s what we are solving today. Contact us to explore applications for your industry or business. Connect everything with affordable IoT sensors and get real-time insights. 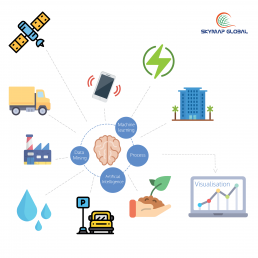 Applications of IoT sensors are only limited by imagination.